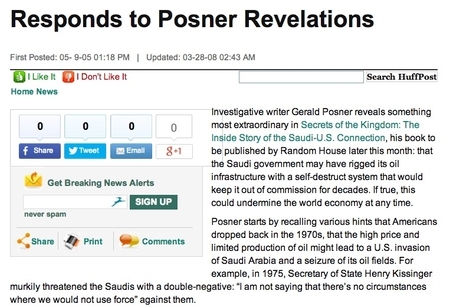 Investigative writer Gerald Posner reveals something most extraordinary in Secrets of the Kingdom: The Inside Story of the Saudi-U.S. Connection, his book to be published by Random House later this month: that the Saudi government may have rigged its oil and gas infrastructure with a self-destruct system that would keep it out of commission for decades. If true, this could undermine the world economy at any time. Posner starts by recalling various hints that Americans dropped back in the 1970s, that the high price and limited production of oil might lead to a U.S. invasion of Saudi Arabia and a seizure of its oil fields. For example, in 1975, Secretary of State Henry Kissinger murkily threatened the Saudis with a triple-negative: "I am not saying that there's no circumstances where we would not use force" against them. In response, Posner shows, the Saudi leadership began to think of ways to prevent such an occurrence. They could not do so the usual way, by building up their military, for that would be futile against the much stronger U.S. forces. So the monarchy – one of the most creative and underestimated political forces in modern history – set out instead to use indirection and deterrence. Rather than mount defenses of its oil installations, it did just the opposite, inserting a clandestine network of explosives designed to render the vast oil and gas infrastructure inoperable – and not just temporarily but for a long period. exploring the possibility of a single-button self-destruct system, protected with a series of built-in fail-safes. It was evidently their way to ensure that if someone else grabbed the world's largest oil reserves and forced them to flee the country they had founded, the House of Saud could at least make certain that what they left behind was worthless. This became a top-priority project for the kingdom. Posner provides considerable detail about the mechanics of the sabotage system, how it relied on unmarked Semtex from Czechoslovakia for explosives and on radiation dispersal devices (RDDs) to contaminate the sites and make the oil unusable for a generation. The latter possibilities included one or more radioactive elements such as rubidium, cesium 137, and strontium 90. It is almost impossible to imagine that anyone could have thought a country might obtain such material … and then divert small amounts internally into explosive devices that could render large swaths of their own country uninhabitable for years. Saudi engineers apparently then placed explosives and RDDs throughout their oil and gas infrastructure, secretly, redundantly, and exhaustively. The oil fields themselves, the lifeline for future production, are wired … to eliminate not only significant wells, but also trained personnel, the computerized systems that seemingly rival NASA's at times, the pipelines that carry the oil from the fields …, the state-of-the-art water facilities (water is injected into the fields to push out oil), power operations, and even power transmission in the region. Nor is that all; the Saudis also sabotaged their pipelines, pumping stations, generators, refineries, storage containers, and export facilities, including the ports and off-shore oil-loading facilities. The sabotage was not finished at some date and left in place; rather, Posner emphasizes, it is an ongoing operation, disguised as regular upkeep or security enhancements. He recounts, for example, that the Saudis were "particularly proud when in 2002 they were able to insert a smaller, more sophisticated network of high-density explosives into two gas-oil separation plants." Posner raises the possibility that this entire scenario is a Saudi piece of theater, meant to deter an outside force but without any reality. Until someone can check for explosives, there is no way of discerning if it is real or bluff. Another limiting factor: the Semtex explosive only has a few more years of useful life in it, expiring in about 2012-13. That said, planners must operate on the assumption the sabotage system is in place and prepare for the consequences. If this single-button self-destruct system does exist and were used, what would be its impact? The U.S. and other governments hold about 1.3 billion barrels of oil and gas in strategic reserves, a stock that would last about six months. Disaster would follow, Posner posits. "Once the strategic reserves proved inadequate, a nuclear environment in Saudi Arabia would create crippling oil price increases, political instability, and economic recessions unrivaled since the 1930s." If such a system is in place, two implications leap to mind. Should the Saudi monarchy retain its grip on power (which I consider likely), it has created for itself a unique deterrence against invasion. But, should the monarchy be replaced by an Islamic emirate in the spirit of Afghanistan's Taliban (its main challenger for power), this ferociously anti-Western government would have at its disposal a cataclysmic suicide-bomber capacity; with one push of a button, conceivably, it could shake the world order. And it would be highly inclined to do just that. Western intelligence services need urgently to do more than listen in on Saudi conversations; they need to find the truth out about those explosives. Should they exist, Western governments need profoundly to reassess their relationships with the kingdom. May 11, 2005 update:I place this development in context at "Don't Underestimate the Saudis." Jibril said the boobytrapping of oil facilities and fields is a signal that Qaddafi's regime fears it can't hold Brega much longer "and the only course they have embarked on is to destroy everything." Related Topics: Oil & Gas, Saudi Arabia | Daniel Pipes receive the latest by email: subscribe to the free mef mailing list This text may be reposted or forwarded so long as it is presented as an integral whole with complete and accurate information provided about its author, date, place of publication, and original URL.